Merry Christmas to who? To you, that’s who! This fuzzy, little felt owl would love to find a home on your Christmas tree. This fowl has a few sparkly feathers that will be quite striking when your tree is aglow. The glitzy bits are actually made from a piece of glittered greenery cut into small pieces. Craft stores typically have a wide assortment of Christmas picks (artificial flowers and greenery), so pick out your favorite one to jazz up your own cute owl! *For the metallic floss, we used dark silver DMC metallic floss. Pin template pieces #1, #2, and #3 to cream colored felt. Cut out felt pieces, remove the pins and paper, and set aside. The eyes, beak, and feathers are too small to pin, so simply hold the template against the felt and carefully cut out the pieces. Cut out 2 eyes from white felt. Cut out 1 beak from gold felt. Cut out 25 feathers from white, gold, tan, and cream felt in varying sizes. 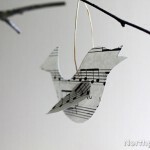 Trim little “leaves” off silver glitter foliage for some extra sparkly plumage. Begin placing feathers along the bottom edge of piece #2. The feathers should overlap the edge by about 0.125". Sew each feather down with a little “x” at the tip. Add the next row of feathers, alternating colors, and sew down the tips. Continue adding rows of feathers until the front body piece is covered. Place the sparkly bits in between feathers and sew in place using white thread with Kreinik Metallic Blending Filament. Using only Kreinik Metallic Blending Filament, sew a tiny dot to secure each feather to the body. Set the body piece aside and gather the face, eyes, beak, gold floss, and metallic silver floss. Take 2 strands of gold floss and 1 strand of metallic floss and group together. Place eyes on the head and begin sewing. Poke the needle through the middle of the eye from the back. This is the center of the eye, and all other lines will branch out from this point. It’s easiest to sew the vertical and horizontal lines first, and then add the diagonal lines. Add a few shorter lines to give the eye more of a pupil. Repeat for other eye. Add beak and sew in place. Place head on body piece so that it is slightly overlapping. To make sure your alignment and spacing is correct, place piece #3 behind the head and body. Sewing only the face and body (not piece #3! ), whip stitch the pieces together using 2 strands of tan floss. Cut a piece of string that is 10" and tie ends in a knot. Turn the body piece over and sew (or glue) the string to the back. This is the ornament hanger. Align the body piece (#1 & #2) with piece #3 and whip stitch around the outer edge with 2 strands of tan floss. When you reach the feathered body, do not sew the feathers. Gently lift the feathers and sew the layer underneath. This gives the owl some nice dimension. Once you’ve sewn about 3/4 around the owl, stuff the owl with Poly-Fil® and then finish sewing. 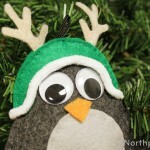 Now your owl is ready to make his nest in your Christmas tree!